Exciting local news by – Eeshal, Fathma, Maryam and Jasmine. An interview with Mrs Razaq regarding the football tournament and an interview with local children’s author Ms Lepeltier. Ms Lepeltier’s books can be purchased from Amazon. 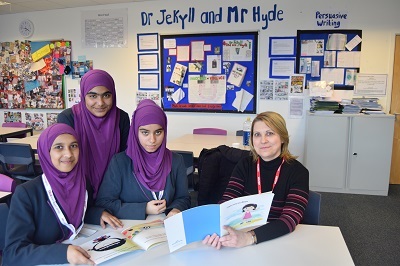 On the 2nd March 2017, Eden Girl’s School Slough, participated in the annual World Book Day. Read more.. Final of First Give – Discover what this project is all about and what it means to the girls to be in the final. Mobile telephone ban by Haadiya’s group. The story we are focusing on is about a woman who has been caught exporting meth in burritos.Futhermore we have chosen this topic to show how people can do such horrific acts and get caught. We hope that after people see this headline they realize that this issue is getting out of control. Our new school – from Eden Girls’ Slough researched and presented a report on our new school building. We interviewed Zara who was the student councillor -Rawan, Hanan, Zara and Anisa.